The FastX3 frame grabber series is for users who anticipate a demand for extreme I/O requirements and/or higher bandwidth, complex image processing and real-time high-speed storage in a cost effective platform. 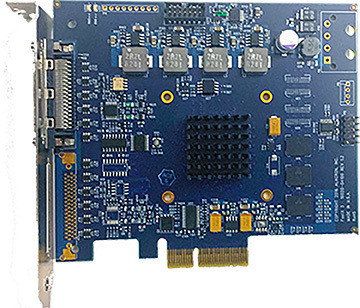 The base FastX3, is a one half-length raw form factor PCIe (X4) Gen2 board with either six basic 85 MHz Camera Link Channels up to two extended full Camera Link camera interfaces. The front-end data is formatted and preprocessed by an Artix FPGA beforie being sent to the PCIe (X4) Gen 2 interface. It also is POCL and has isolated inputs including three LVDS I/Os. Peak DMA rate - 2GB/sec bidirectional. © 1994-2017 Alacron,Inc. All Rights Reserved.